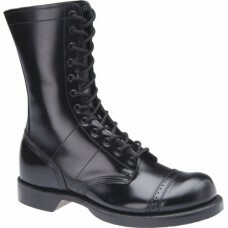 Corcoran boots are some of the best military boots around, and these high-shine, combat boots are no exception. Functional and fashionable, these black, military boots are less about combat and more about show, but that doesn't mean they aren't versatile in their use. 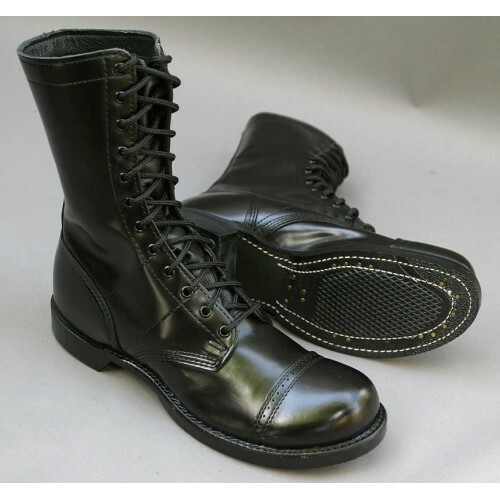 Equipped with a dress sole and toe cap, these boots will keep you looking sharp, whether you are at a military event or just out and about. Made to be durable, they have a full-welt construction and double rubber soles, which increase they life span. Easy walking heels also make these high-shine boots more comfortable than your standard fare. Marching won't kill your feet in these beauties either, as these unlined Corcorans come with steel shanks embedded in the body of the boot. Shanks reduce the impact of each step, so these leather boots can be used both in show and when you need to put in some heavy work. A DRYZ cushioned insole also comforts your foot and further prevents injury. To top it all off, the sole on these boots is oil-resistant and the boots themselves are water-resistant, meaning you can use them in a variety of situations and climates: desert, rural, urban, or indoors. These dressy, military boots are a must-have for anything searching for that sleek, military look. Built to last as well, these Corcorans give you the best bang for your buck. Note: if you have not worn these boots and do not have size experiences, the 'Munson' tends to run about 1/2 size larger than standard boot sizes.